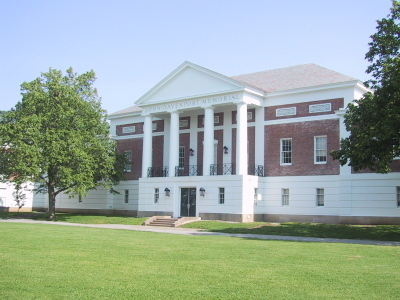 The Davenport Squash Courts were constructed in 1933-34 as a unit in a series of physical education buildings, joining the Cage, built nine years prior. Those two units were joined by the Alumni Gymnasium two years later. John Davenport of the Class of 1858 made a bequest to the College, and some of the money was used to constuct these squash and handball courts. (Archives & Special Collections, Buildings and Grounds Collection, box 4, folder 28). 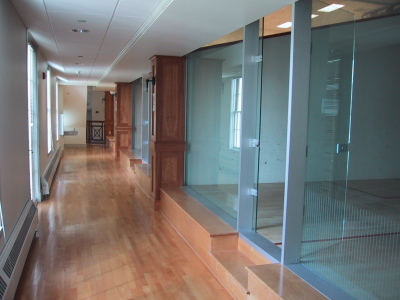 The interior of the Davenport Squash Courts, renovated in 2000. (Photos taken 1 June 2002).